In The Battle Between Lyft And Uber, The Focus Is On Drivers : All Tech Considered Users say the driver-passenger relationship is different: Lyft is "your friend with a car"; Uber is "everyone's private driver." Still, competition is so great that Uber wooed rival drivers covertly. A car with Uber and Lyft stickers at Los Angeles International Airport. Uber dominates the fast-growing ride-hailing business. But Lyft is waging a spirited battle to keep up. "I don't really care Lyft versus Uber," she says. "But I had the chance to make money and I was getting free Lyft rides." In November 2014, a woman who worked for Uber told Dure-Biondi she could make cash quick. They met at the Arbor Cafe in Oakland, Calif.
"She had a laptop, and then she had me sign some" papers, Dure-Biondi says. By the end of 2014, Uber had hired hundreds of people across the country for this very grass-roots job. For its part, Lyft says it offers bonuses to current drivers who sign up new ones. What Does Your Uber Driver Think Of You? Dure-Biondi got Uber training on the spot. "We took a couple of rides together, and she kind of showed me how to" get Lyft drivers to switch to Uber, Dure-Biondi adds. The recruiter, who independently verified these details with NPR, gave Dure-Biondi an iPhone. For two months, Dure-Biondi would order Lyft cars, hop in and start chatting up the driver: How are you doing? How's your day? "Oh, where are you from? Asking nice-people questions. Just being nice," Dure-Biondi says. And then, she'd casually slip in: "Why'd you decide to drive for Lyft? Oh, yeah, that's really interesting. Well, would you ever consider driving for Uber? Why did you decide Lyft over Uber?" At this point in the conversation, Dure-Biondi would reveal that she's an Uber ambassador, and if the driver signs up right now, they'll each make hundreds of dollars. Interestingly, only one guy agreed. Dure-Biondi says the big bonus wasn't enough: "A lot of people chose Lyft because of the morals of it versus Uber. It was more of a friendly company." Scott Christopherson drives for both Lyft and Uber. "Yeah, I think that there is a difference in the relationship between passengers and drivers in the two platforms," he says. NPR spoke with two-dozen people who decided to work for both companies. And consistently, these drivers say: In Lyft there are fewer expectations. It's more touchy-feely. Passengers are supposed to hop in the front seat and be friendly because, as the motto goes, the driver is "your friend with a car." "I have very few problems with Lyft passengers," Christopherson says. "They're generally very nice. Or if they're not nice, they're quiet." Uber started as a luxury brand. Its motto is "everyone's private driver." So, Christopherson says, for people like him — people who drive super-part time, who have other jobs — it's not a great feeling when passengers expect a chauffeur. "They don't really kind of care about what you think of them. And so it's a little more fraught," he says. Driver Jennifer Rose agrees there's a difference, but doesn't think it's a bad thing. On days when she's high on life, has great news about her kids, she can really enjoy a chatty Lyft passenger. Other times, she likes the quiet. "I can appreciate the person who wants to talk the whole trip or the person who just wants to sit there and take a ride," she says. Financially, there are differences too. NPR examined drivers' payment statements. Lyft takes 20 percent of fares. Uber takes 20 to 25 percent on the standard service, and 28 percent on the SUV service. Most drivers say these percentages are fairly comparable. It's another line item that stands out: "The one thing that Lyft does and Uber doesn't is tipping! Did you notice that looking at the [statements]?" Christopherson says. Lyft says its drivers earned about $58 million last year — on top of fares — through tips. Lyft Chief Marketing Officer Kira Wampler says the company is more focused on driver well-being than Uber is because Lyft has a different mission. While both companies want to improve transportation, Lyft explicitly has an environmental goal: having fewer cars on the road and filling empty seats. "You can't fill every seat in every car unless the people in each car treat each other well," Wampler says. Uber declined an interview to discuss driver benefits. But in an email, Faryl Ury, a company spokeswoman, says it's misleading to just say that Uber takes a bigger cut from drivers. Driver earnings depend a lot on how many rides they get, and in most markets Uber has more passengers calling. On tipping, Ury says, research shows tips are not really based on quality of service, so drivers could be rewarded or dinged unfairly. Ryder Pearce, co-founder of Sherpashare, a site that tracks wages and expenses for on-demand drivers, says competition is an "enormous benefit" for workers. When Uber or Lyft announces a new perk, the other follows, thereby pushing up the floor. For example, both companies recently announced short-term car rentals for drivers who don't have their own wheels or insurance. 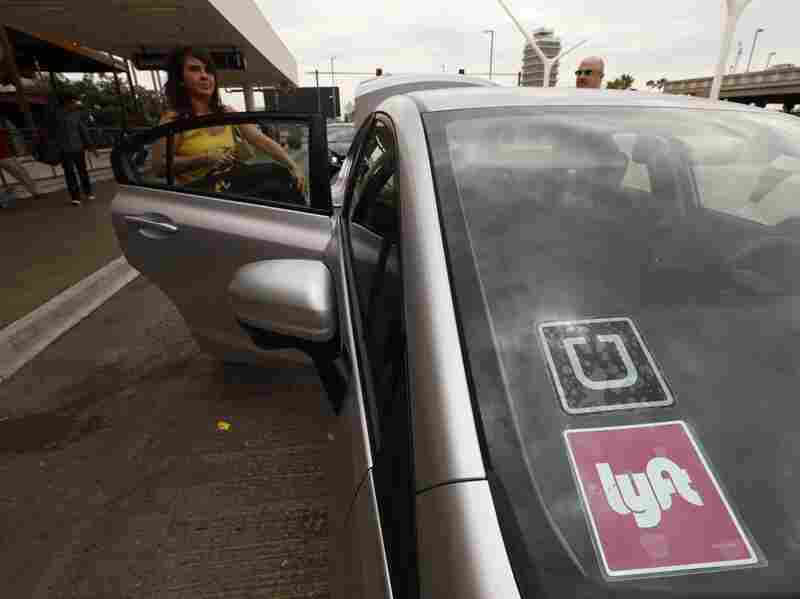 "Uber and Lyft both recognize that if they don't keep rates competitive, and add more driver perks — and both have very large teams working on this — they will lose out on drivers," Pearce says. Sherpashare data indicate many drivers work for more than one service. Pearce says they don't have a strong incentive to be loyal because the differences between companies are not that stark. Drivers' bottom-line concern: "They just want to log in and have passengers to pick up," he says. If one company won and got all the business, he says, drivers would lose out.